The worksheet includes: listening comprehension (based on a dialogue on video), spotting the language function, vocabulary search and a guided role-play. 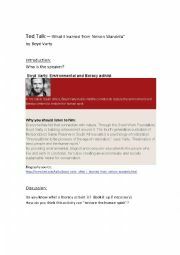 Ted Talks - Video lesson. Video lesson. Present Simple: Busy Mom Morning Routine. 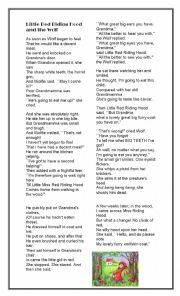 Poem by Roald Dahl - Reading, Discussing, Reported Speech. Based on the highly popular TED talk by Amy Cuddy: "Your Body Language Shapes Who You Are", the worksheet contains grammar , vocabulary and listening comprehension activities. Key included. Hope you will find it useful! 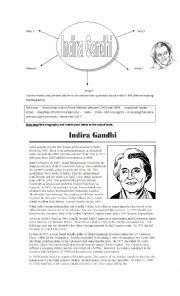 The worksheet includes a biography, a video interview and Indira Gandhi´s quotations. There are activities that involve reading, listening and speaking skills plus a vocabulary exercise and discussion questions. The key is included. 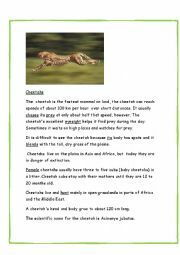 This is a reading comprehension worksheet based on a text about cheetahs from National Geographic Kids. 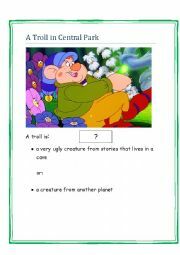 The activities include: vocabulary, true/false statements and comprehension questions. There is a link to the video and the key is included. I hope you´ll find it useful! This is based on the first part (around 15 minutes) of the animated movie "A Troll in Central Park". It contains simple vocabulary and comprehension activities. Key included. I hope you´ll enjoy it. Video lesson. 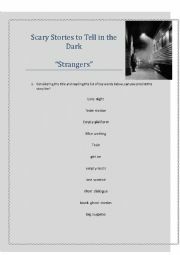 Scary Stories to Tell in the Dark. The activity was designed for upper elementary / lower intermediate students but can be adapted to fit other levels. It consists in predicting, watching a short film, retelling and completing part of a dialogue. Hope you find it useful and interesting! Notes and key included. Song by Nancy Sinatra. (Kill Bill soundtrack) The activities include: gap filling (with verbs in the past) as well as comprehension and discussion questions about the story told in the song. This is the SECOND PART of the presentation about Buenos Aires uploaded today. There is further information and a short revision of both parts at the end. Make sure you check out both parts. I hope you´ll find it useful.